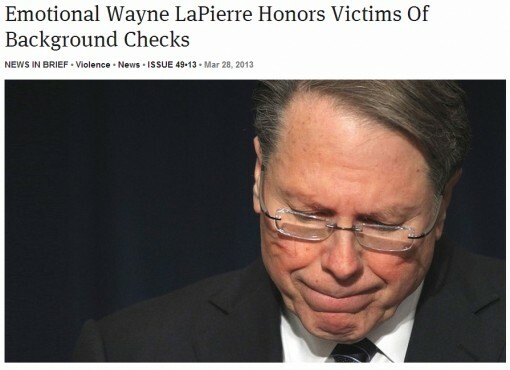 Another hilarious story from The Onion mocking National Rifle Association executive vice-president Wayne LaPierre. Hilarious story from The Onion mocking Wayne LaPierre. When honest pundits try to piece together what happened to the American Right, one of the phrases that tends to get bandied about is “epistemic closure”, which is a really fancy way of saying that everyone on the Right gets their information from everyone else on the Right, with none of them leaving their information cocoon to see or care whether their information plays well with the broader public or is even accurate. Now, it’s one thing to get information from sources that confirm your ideological beliefs. It happens to the most circumspect of us, and sometimes we bloggers relay false information that “seems” right and then are forced to retract. If we do it more than very occasionally, we begin to lose credibility. So even unpaid bloggers, if they’re any good, will do a little research to confirm what they’ve read lest they lose their audience. If they’re shown to be wrong, they’ll post an update with an apology and/or retraction. And they’ll do this level of research even if they’re churning out several posts a day at whirlwind speed. 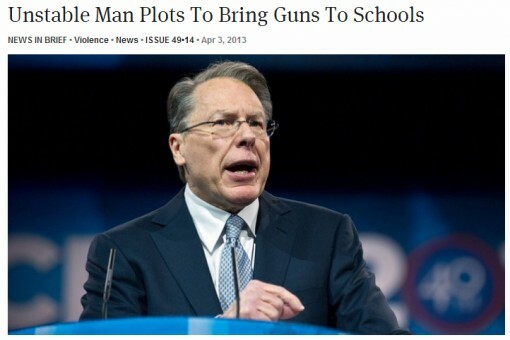 But for a national organization like the NRA to have invested this much organizational time, money and energy into an ad campaign based on false information from a widely discredited source, without doing even the first steps to confirm the information that is the entire basis for the attack? That is inexcusable solipsism and epistemic closure of the first order. That’s because, while arguments from authority are hard on the Internet, substantiating arguments is easy, thanks to the miracle of hyperlinks. And, where things aren’t linkable, you can post actual images. You can spell out your thinking, and you can back it up with lots of facts, which people then (thanks to Google, et al.) find it easy to check. And the links mean that you can do that without cluttering up your narrative too much, usually, something that’s impossible on TV and nearly so in a newspaper. So far, so good. One of the advantages of the Internet is the ability to quickly send readers off to judge for themselves whether or not you’ve accurately summarized some study or report, for example. When writing an article about some new study or other, no newspaper would have devoted the space (much less paid for the rights) to reproduce the study in its entirety. With the Internet, however, if someone makes a claim it is often fairly easy to check the veracity of that claim. That’s what I assumed Reynolds was talking about, but he wasn’t. Rather, Reynolds and other bloggers seem to find stories that fit their ideologies and then follow the old “too good to check” mentality of some old school media. For example, often what you’ll find on Instapundit is some proactive text with a link. But when you follow that link, what you often will find is a summary of an issue with a link to the source. But when you follow that link, it is often itself just a link to someone else’s summary and so on to the point where you may have to go through 5 or 6 links before you to get to the bottom of the rabbit hole. It is possible to use Google to fact check some of these extraordinary claims, but Reynolds rarely bother to do so, and often neither do those he’s linking to. While they were raging against the mainstream media’s techniques, conservative bloggers ended up largely embracing and extending them. After all, even on the Internet doing actual research to validate a claim can take some time, and any delay in getting out a hit piece on one’s ideological enemies is something right wing bloggers apparently can’t afford. The other problem is that such research might end up either disproving the claim outright or at least revealing it to be much more nuanced than originally claimed. Neither are outcomes conducive to the hermetically sealed environment that ideologues insist on building for themselves. This is where I would offer an objection if I were reading this on some other blog. Yes, the right has built itself an echo chamber, but surely leftists and liberals often engage in similar behavior. Just go read DailyKos or similar sites for awhile and you’ll see plenty of similar examples. True enough, but Reynolds and others set themselves as being a more accurate, thoroughly fact-checked successor to the mainstream media. Instead, they helped kick old school media to the curb only so they could go on to make the same mistakes and engage in the same ridiculous practices. Meet the new Dan Rather; same as the old Dan Rather. As you might guess from reading my anti-animal rights website I am very much pro-hunting. On the other hand, I’m also very pro-truth, which is why this pack of lies from the Heritage Foundation is so annoying. There’s enough things to hang the anti-hunting movement with; conservative groups don’t have to go out and lie about proposed legislation that might impact hunting. New York has a large, vibrant hunting community outside its metropolitan areas. Assemblyman Alexander Grannis, who is from the nationÂ’s largest metro area, has drafted a bill that could, if passed in its present form, make all hunting illegal in the Empire State. The text of New York State Assembly Bill 1850 reads, in part: Â“A person is guilty of aggravated cruelty to animals when Â… he or she intentionally kills Â… an animal or wild game [or] wild birds.Â” You donÂ’t have to be a National Rifle Association die-hard to see the danger in a bill that makes pursuit of game, Â“so as to capture or kill,Â” a felony with a minimum one-year prison sentence and a $5,000 fine. Advocates, of course, claim this is merely a means to criminalize the torture of animals. But the phrase Â“intentionally kills,Â” in this context, clearly could apply to hunters as well as those who would mistreat animals for fun. A person is guilty of aggravated cruelty to animals when, with no justifiable purpose, he or she intentionally kills or intentionally causes serious physical injury to a companion animal, OR WILD GAME AND WILD BIRDS AS DEFINED IN SECTION 11-0103 OF THE ENVIRONMENTAL CONSERVATION LAW, with aggravated cruelty. For purposes of this section, “aggravated cruelty” shall mean conduct which: (i) is intended to cause extreme physical pain; or (ii) is done or carried out in an especially depraved or sadistic manner. So the bill doesn’t call for prosecuting people who kill wildlife, but rather people who kill wildlife “with no justifiable purpose” with the intention of inflicting extreme pain or killing in an extremely depraved or sadistic manner. Rather than focus on “no justifiable purpose” or “in an especially depraved or sadistic manner”, England and Muscatello deceive readers into thinking that the bill applies to any intentional killing of wildlife, such as hunting. This is an outrageous distortion. The last thing those of us who oppose the animal rights movement and its anti-hunting agenda need are people like England and Muscatello adopting PETA-like tactics and distorting the truth. Hunters in the Crosshairs. Trent England and Steve Muscatello, Heritage Foundation, March 31, 2005. Interesting — while ripping on the National Rifle Association’s NRA News site the other day, I mentioned that in order to view the site you have to enter your name and e-mail address but that there is no formal registration system. You have to give the same information every time. And the morons at the NRA apparently decided that it would be a good idea a) to spam people who are dumb enough (like me) to use their real e-mail address, and b) not to eliminate duplicate addresses if you visited the site on more than one occasion. So this evening I received not one, but two spam messages from the NRA basically apologizing for some sort of technical problem they had earlier. Earth to NRA: your real problem is your complete cluelessness.